And sometimes it bites hard! Shannon and I have been on the road, traveling and working for almost two years. You would think that at this point, we would be pros at what to pack in a pinch, and what to leave behind at all costs. Well, in most cases we are, although we have had nightmare luggage scenarios in the past. Our packing process has evolved over the last 23 months. But it’s still a process, a process, a process. Come to think of it, the process has evolved so much, that on another one of our non-hiking days, I might even write about that. But today, which is a non-hiking day, in fact two days after we left Lourdes, I am focused on the latest in packing debacles. We originally thought we would arrive in Lourdes on or around April 29, take 3 days to explore, and begin hiking on the one year anniversary of my mom’s death, May 2. We knew the instant we landed in Lourdes however, that we were not only not logistically prepared to hike El Camino in 3 days, but we were not emotionally prepared to take on what it actually meant to deal with my mom’s sad anniversary, in her namesake, this rural community near the France/Spain border. As May 2nd slowly approached, Shannon and I also realized that, however good intentioned we thought it would be to officially begin hiking on May 2nd, it would be much better for the memory of my mom, to spend the day in Lourdes itself, contemplating and remembering her. Every trip has its own set of packing mores, so to speak. What is acceptable and of value to one trip can be completely different on another. 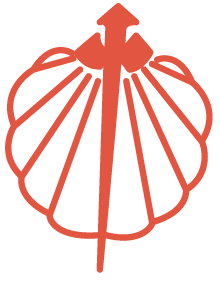 There was one major factor going into hiking El Camino de Santiago, that neither Shannon nor I considered as much as we should have- and that is that neither of us have ever hiked El Camino de Santiago, or anything like it. I have done an extensive amount of hiking and camping around the U.S., and quite a few overnighters or 2-3 nighters. But I have never legitimately hiked more than 7-10 miles a day, for days (and certainly not weeks!) at a time, with everything I needed in life strapped to my back. Add to the challenge- much of El Camino is on concreted roads and highways. Punishing concreted roads and highways. Through past hiking experiences, I know the objective is to limit the total weight of your pack to approximately 10% of your total body weight. However, based on the relatively short packing hikes I have done in the past, that was never a problem. And, even if I did exceed those limits, packing with a very heavy pack for a day on dirt does not leave that large an impression on the psyche. Enter Shannon and Eric, travelers extraordinaire, but extraordinarily ignorant distance hikers. Concrete distance hikers. Multiple countries distance hikers. Epic. We spent hours on end researching El Camino blogs for advice on how to prepare logistically, emotionally, monetarily, and packing. Our main “reasonable” challenge is that most pilgrims on these Camino sites were debating whether to bring an iPhone for phone/camera/entertainment versus a kindle, solely for entertainment. OR… not to even bring any electronic gadgets at all! Obviously Shannon and I are blogging, editing fotos and videos, and dealing with clients as we hike. Our laptops are 100% necessary. Period. But as we meticulously prepared our packing lists, focusing on a minimalist pipe dream, it started to rain “necessary” gear, and then it started to pour. We need camera equipment in order to document… and iPhones… and chargers. But do we need iPads, ipods, and tripods, oh my? When you began to add our luxury “necessities” to the usual list of hiking must haves, all of the sudden, our backpacks were about 30 pounds/13.6 kilos. And that did not include water (which is HEAVY!) and food, and other daily, sundry items. It did not help, that we had been traveling internationally for two months prior to beginning our pilgrimage. Getting rid of items that were pertinent before the hike became increasingly difficult as the clock towards D-Day began. After months of planning, reading, researching, packing, trashing, re-packing, shipping home, re-packing, donating, and re-packing a final time, it was time to grit our teeth, swing our packs over our backs, put our heads down, and take that first step. Oh what a painful step that would be! This video shows our final thoughts on our bags, and the crap we “thought” we needed 2 days ago, our first official day of hiking, as we finally began leaving Lourdes, and began our ascent towards Santiago- one (painful) step at a time. Tomorrow, I will reveal how that first day of hiking actually went, and whether it was a good or bad idea to begin hiking with almost 35 pounds on our backs. ← May 8th, 2014: Today is day 7….ouch.